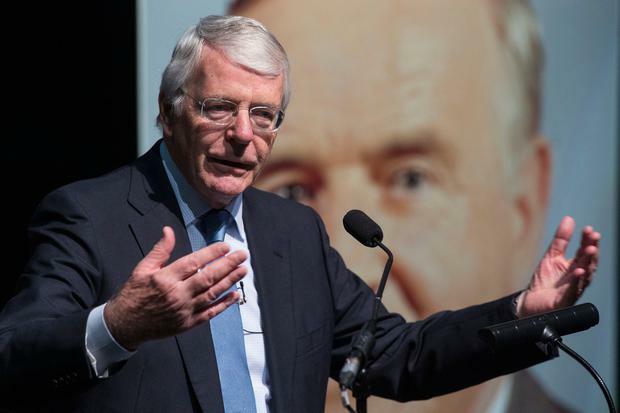 Former UK prime minister John Major has urged the British government to halt Brexit and take time to find a way through the deepening political crisis. Speaking in Dublin, the former British leader, who won vicious internal EU battles at the London parliament in the early 1990s over the Maastricht Treaty, urged an immediate revoking of the so-called Article 50 process that drives the EU-UK divorce proceedings. “Whether you are a Remainer or a Leaver, no one can welcome chaos,” he told an invited audience at the Institute of International and European Affairs. In attendance were two former Taoisigh, John Bruton and Bertie Ahern, and Mr Major praised their successful work in bringing peace to Northern Ireland. In a telling aside, he said he doubted whether Theresa May should ever have done a coalition-supporting deal with the Democratic Unionist Party in June 2017, because this raised doubts on London’s joint-role with Dublin as guarantors of the Good Friday Agreement. The former prime minister, who served from 1990 until 1997, said it was imperative to calm the money markets, where sterling has again hit record lows. “The clock, for the moment, must be stopped. It’s clear that we now need the most precious commodity of all: time,” he said. The veteran of many knife-edge negotiations in Europe could see some possibilities for the EU to give Mrs May concessions on the 585-page draft Withdrawal Agreement which might help her. But he acknowledged that the EU had “boxed itself into” refusing to do this. Mr Major said the EU would probably give assurances on upcoming talks about the future EU-UK relationship after Brexit happens. He warned a “hard Border” in Ireland would increase the risk of a return to violence and insisted that must be avoided.